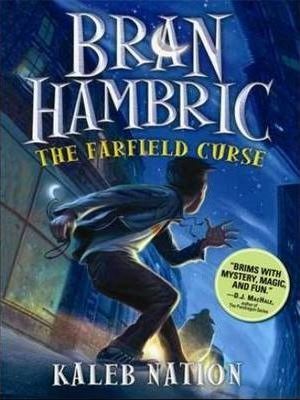 "The Farfield Curse is a story you'll want to pick up, but not put down!" --Kaza Kingsley, author of the bestselling Erec Rex series. What if your mother was a criminal? What if her crime was magic? What if magic ran in the family? Bran Hambric was found alone in a locked bank vault when he was six years old. He doesn't have a clue how he got there, or any memory of his past. There's only one explanation: Magic. But magic is outlawed in the Great and Glorious City of Dunce. "It is delightfully mysterious, suspenseful, and all things brilliant." "Once you start reading you are not going to be able to put it down." "Don't read it in public, people will stare at you for laughing so hard." On the third night of the third month in 2003, 14-year-old Kaleb Nation suddenly imagined a boy and a banker on a roof waiting for a burglar to come. From that original idea was born the story of Bran Hambric. The novel would take most of Kaleb's teenage years to complete. Aside from writing, Kaleb is a blogger and former radio host; he is the creator of the wildly popular TwilightGuy.com. His personal website is KalebNation.com. He currently lives in Los Angeles, CA and is now 21.